With a background in Sport and Education, and a burning desire to be his own boss, Chris Atkins was looking for an opportunity into the world of entrepreneurship. Then, a chance conversation with his Grandma about her evening classes provided Chris with the spark of a unique business idea and Move-It Mobility was born. Chris tells us more about his start-up journey. Can you tell us a bit more about Move-It Mobility? At Move-It Mobility we believe in enhancing the health, fitness and social well-being for all. Move-It Mobility deliver a wide range of activities into Care Homes, Schools and Nurseries. In Care Homes we deliver a variety of activities to combat social isolation and physical impairments. This takes the form of seated recreational games and musical movements. We also provide services for dementia care, such as Cognitive Stimulation, which has far reaching benefits for older people, including preventing physical decline and improving cognitive function. What was your background and your day job before you decided to become self-employed? At A-level, I received a distinction in Sports Studies and went on to study Sport and Education at Bishop Grosseteste University. Whilst at Uni I was working for a coaching company which provided me with great insight into the world of work and developed my CPD with various qualifications and experience. After graduating, I started working in the evenings for Positive Futures as their Lead Coach. At Positive Futures we would visit RAF bases and the children of service men and women who were on deployment. This was done as part of the Government’s Community Covenant Project. Around this time, a chat with my Grandma planted the seeds of a new idea. She was telling me all about the classes she loved attending in her community which were aimed at preventing social isolation through various activities. As I was only working in the evenings at this point, my day time was free, so I decided to give it a shot and founded Move-It based around my skills, training, and the three areas of health, fitness and well-being for all. The free service from professionals attracted me to attend an initial meeting with my advisor, Natasha Travis, at NBV, and this proved very beneficial. At NBV I have learned a lot about the structure of my business and we have recently become a Limited Company. What have been the highs and lows of your journey so far? There are always highs and lows in business, you will gain clients and lose clients due to a variety of different reasons. I have had to overcome various challenges since setting up Move-It. Learning all aspects of business has been the greatest challenge. On the plus side, I have learnt about business along the way, set up various Move-It sessions, sold the company concept to over 100 clients and created a franchise package and managed team members. I feel as though I have grown as the business has been growing. I now have an interview for the first stage of The Apprentice with Sir Alan Sugar, after recently sending in my application. Our business is unique as we are the only company that delivers these services on a mass-scale. Our plans are to franchise Move-It Mobility to deliver session around the country. We aim to live by our strapline: Enhancing the health, fitness and social well-being for all. Move-It Mobility has filled me with a great purpose and sense of pride. The goal to go nationwide with this is the next big achievement I want to attain, and I have the motivation and enthusiasm to ensure it goes all the way. We are so passionate about offering the best service possible to help meet our aims and objectives. This year I will be delivering various business presentations at Universities across the country to third year students on Business Management Courses and Sports Courses. 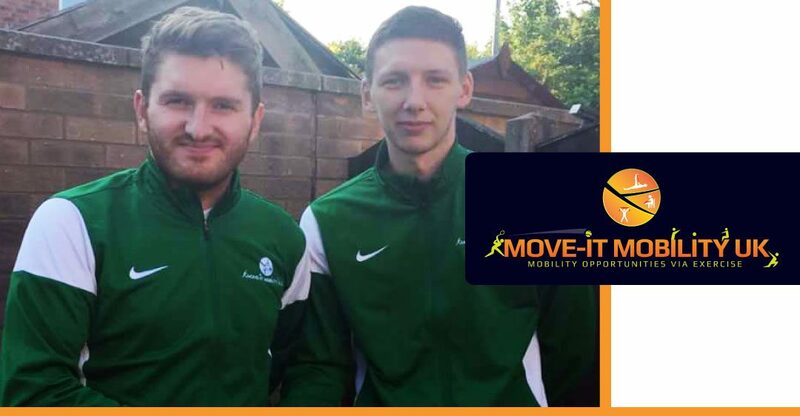 In these presentations I’m looking to spread the word about Move-It Mobility and I’ll be looking to find people to join the team of staff and franchises. Do you have any advice for others embarking on their start-up journey? The best tip I can give is to network as much as you can. Also, put in the hours and remain motivated, this will give you a greater chance of success.